Water is Sacred on a stunning Baby Long Legged Baby Rib Bodysuit by Christi Belcourt. - Women are water protectors “Water is Sacred,” artwork by Christ Belcourt with Isaac Murdoch of the Onaman Collective. From the wild rice lakes of Minnesota to the Klamath River Basin in Southern Oregon and Northern California, Flint Michigan, the Great Lakes, Canadian tar sands, communities across the globe are seeing increased pipeline and other fossil fuel infrastructure development impacting clean water, native land and the climate. Take a stand for the land, and be a water protector. LaDuke cited the example of the rising resistance to fossil fuel infrastructure. She participated in the Dakota Access Pipeline protests at Standing Rock last year, where pipeline opponents invoked the term “water protector” to describe their position. “I’m very honored to be a water protector,” said Winona LaDuke. Garment: 5.0 oz., 100% combed ringspun cotton print in fabulous black shimmer ink. COMMUNITY SCREEN PRINTING: We Love our Water, and Manoomin (Wild Rice), not their dirty oil for Water is Life (Nibi Bimaadiziwin). Garment screen printed is part of our youth and community project at Pine Point: Jio Misawaabandaaming; how we envision our future, is a worldview of positive thinking. Creating: ‘mino bimaatiziiwin,’ a good life, here at Pine Point and Round Lake (White Earth territory). We love our otters as we do our mothers and baby water protectors! Artwork by Christ Belcourt with Isaac Murdoch of the Onaman Collective, featuring Christi Belcourt's "Heart with a Fist" Water Protector image. . Here is an important initiative called that Honor the Earth supports: NIMKII AAZHIBIKONG Collective. Garment also features Honor The Earth’s beautiful floral “Water Protector,” logo on the garment designed by LittleRedfeather..
Water is Sacred on a stunning Infant Organic Baby Rib Short Sleeve One-Piece in Galaxy blue by Christ Belcourt with Isaac Murdoch of the Onaman Collective. From the wild rice lakes of Minnesota to the Klamath River Basin in Southern Oregon and Northern California, Flint Michigan, the Great Lakes, Canadian tar sands, communities across the globe are seeing increased pipeline and other fossil fuel infrastructure development impacting clean water, native land and the climate. Take a stand for the land, and be a water protector. Currently production - will be available in the month of Dec. 2018. Artwork by Christ Belcourt with Isaac Murdoch of the Onaman Collective, featuring Christi Belcourt's "Heart with a Fist" Water Protector image. . Here is an important initiative called that Honor the Earth supports: NIMKII AAZHIBIKONG Collective. Garment also features Honor The Earth’s logo on the garment designed by LittleRedfeather. This is a great everyday item for the little bundle of joy in your life. It’s ultra-durable and will stand up to whatever your baby can dish out. We Love our Water, and Manoomin (Wild Rice), not their dirty oil for Water is Life (Nibi Bimaadiziwin). Garment screen printed is part of our project: Jio Misawaabandaaming; how we envision our future, is a worldview of positive thinking. Creating: ‘mino bimaatiziiwin,’ a good life, here at Pine Point and Round Lake (White Earth territory). Makes a great gift for the new addition in any family. Honor the Baby and love our water celebrating our Mothers, daughters and grandmothers. This design celebrates our Mothers, daughters, grandmothers and babies through our adorable "Nigig" otters we have in our Anishinaabe territory in northern Minnesota who carry sacred medicines from the water. We love our otters as we do our mothers and baby water protectors! Garment: Triblend Deep Scoop Half-Sleeve T-Shirt. 4.7 oz., preshrunk 50% polyester, 25% combed ringspun cotton, 25% rayon; 30 singles; semi-fitted silhouette, half-sleeve & curved bottom hem. Love Water Not Oil on a stunning Baby Long Legged Baby Rib Bodysuit. Garment: 5.0 oz., 100% combed ringspun cotton print. 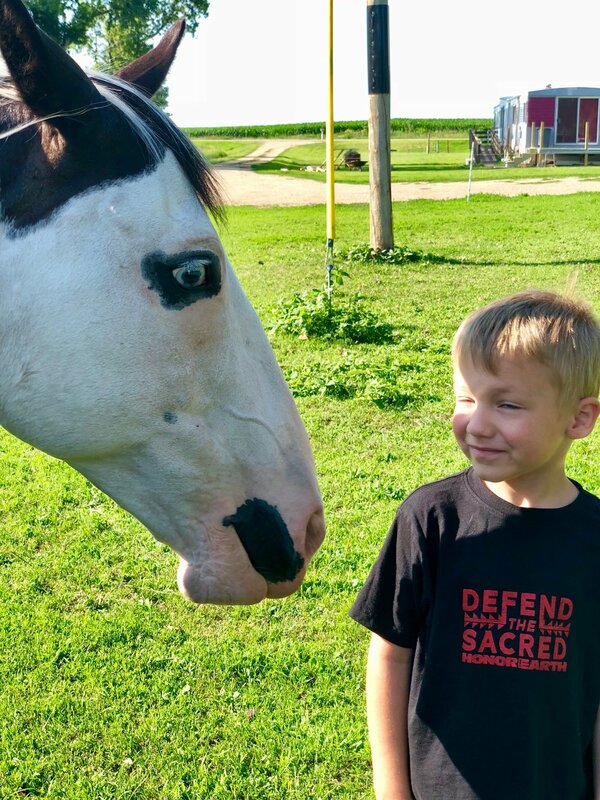 Toddler + Youth Defend the Sacred TShirts - Rock the Lands! Youth Defend the Sacred Hoodie - Rock the Lands! Toddler + Youth Red Love Water Not Oil TShirts - Rock the Lands! We ship across the world and we design our products for all walks to enjoy. From January 1st until Mid-November please allow 5-7 business days of production processing before shipment. All shipments are registered "USPS Priority Mail." You can order multiple products. If you are having issues adding multiple items to your shopping cart, here is instructions to do that. Repeat the steps above until you have finished adding your multiple items. When you are finished then go back to the "cart" browser you left open, and "refresh" the page. There your multiple items added will all be in your "cart"
There is no exchanges, or refunds. Our team at this time will not be able to offer an exchange or return policy ... we are a small operation, and limited capacity to offer an exchange program. We are working hard to improve, and grow our merchandising operations. Miigwech for your patience. Having issues finding the “Cart” icon? The cart icon on mobile/tablet is on the lower part of your screen and for desktop/laptop they are located in the upper right-hand area of your screen. You can also elect to enter www.honortheeathmerchandise.com/checkout where your cart refreshes anything you add to the cart - can also modify your cart in that page. Donate to Honor the Earth We are extremely grateful for your support. You make this movement possible! AmazonSmile is a simple and automatic way for you to support your favorite charitable organization every time you shop, at no cost to you. When you shop atsmile.amazon.com, you’ll find the exact same low prices, vast selection and convenient shopping experience as Amazon.com, with the added bonus that Amazon will donate a portion of the purchase price to your favorite charitable organization. You can choose from nearly one million organizations to support. To shop at AmazonSmile simply go to smile.amazon.com from the web browser on your computer or mobile device. You may also want to add a bookmark tosmile.amazon.com to make it even easier to return and start your shopping at AmazonSmile.